With SQL Recovery, your dream of successful MS SQL repair will come true! MS SQL database repair can be done with delight… MS SQL suspect database repair can be done with ease... MS SQL MDF repair can be done with confidence…Using this simple and intuitive software. You don't have to ache your brain to understand the technology of the software and you don't have to strain your brain cells in order to use this tool. It has a very interactive user interface that will talk to via the self-explanatory screen instructions and you can just keep going with the MS SQL repair process following these consecutive instructions. The question - "How to repair corrupt SQL database using this software?" will not surface in your mind because everything is easy and crystal clear. Also, the steps of the SQL recovery process are given on the website as well as in the help manual of the software. Repair MS SQL database restfully and relaxingly! Microsoft SQL Server is widespread computer application used in organizations for the creation & maintenance of databases and much more. Many office operations are today unimaginable without using SQL. Because this application is used for successful processing of important databases, its MDF files that store the critical information are mission-critical in nature. The loss of these MDF files can even end many crucial operations in any office. Thus, it is required by the Database Administrators that they should make all feasible safety efforts to protect these important MDF files. But, any sudden corruption issue can create panic by affecting these files. At this point, SQL Recovery tools to repair corrupt SQL database move in. Errors Erupt After MS SQL Corruption – SQL Recovery Tool can Help! Panic would surely take birth after your crucial MDF files corrupt and you fear of losing all the important information stored in those MS SQL files. But, rationality would say that without welcoming panic, you should think on the terms to repair suspect SQL database. 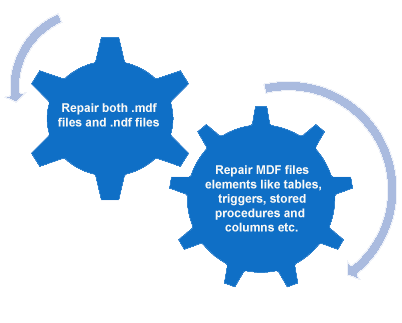 This can be wisely done by choosing an efficient MS SQL repair tool to repair MDF file. 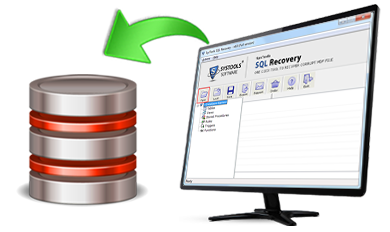 Demo of SQL Recovery is a FREE evaluation version that can be downloaded online for trial. This version gives you’re the preview of recoverable items but will restrict to save the recovered items. To recover ALL items from corrupt MDF and save them to your system, you need the Full Licensed version of SQL data recovery software. Personal License is ONLY for $249. SQL Recovery tool to repair MDF database: can serve you in the best possible way you can ever dream of! You cannot fix SQL database more finely with any other tool than you can do so with SQL MDF Recovery software. This is a superior and supreme software to fix corrupt SQL database. It can perform very quickly in an impeccable way and recover data in any corruption scenario. Tables, stored procedures, views, default rules, values, constraints, functions, triggers, checks, user data types and other SQL elements can be recovered easily. Records of corrupt MDF database files are restored and saved in separate script file. Meta data (including unique keys, foreign keys, primary keys etc) is recovered. Software works with Windows 98, ME, NT, XP, 2000, 2003, Vista, 8 and 10. MS SQL repair tool is capable to repair MDF file of SQL 2000, 2005, 2008, 2012, 2014 and 2016. Software support advanced data type including Datetime2, sql_variant, geometry etc. How to repair MDF file? Though this question will not arise with most of the users BUT if you are still thinking – "how to fix SQL Server using SQL recovery?" then you can simple go to the How it works page & see the steps of MS SQL repair process. You can also find these steps in the help manual along with the software. Even if you don’t have to time to go through these steps, there is nothing to worry because the software interface is itself explanatory enough to take you through the whole process. Now you can easily Repair MSSQL Database with SQL data recovery Tool. It is highly developed data recovery software for SQL Server corruption issues it can handle all the error related to SQL database corruptions.